MOSCOW, December 20. /TASS/. The containers with the materials from the manned Soyuz MS-09 spacecraft where a hole had been found, and also samples of the spaceship’s meteorite shield will be transferred to the investigative bodies on December 24, a source in the domestic space industry told TASS on Thursday. The descent capsule of the Soyuz MS-09 spacecraft with three crewmembers of the International Space Station (ISS) successfully landed in the Kazakh steppe early on Thursday. The crewmembers also brought with them to Earth the containers with the probes gathered from the hole found in the craft’s habitation module. "In the coming days, the descent capsule of the Soyuz MS-09 will be transferred from Kazakhstan to Energia Space Rocket Corporation [the developer of Soyuz MS spaceships] but work with it will start only on Monday. On this day, all the materials will also be transferred to the competent bodies, including the FSB [Federal Security Service]," the source said. Russia’s State Space Corporation Roscosmos did not comment on this information. 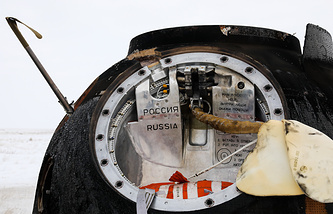 Roscosmos earlier said that the containers with the materials from the hole drilled in the spacecraft would be handed over to investigators within one or two days. Russian cosmonauts Oleg Kononenko and Sergei Prokopyev made a spacewalk overnight to December 12 to inspect the hole in the Soyuz spacecraft’s casing. They unsealed the thermal insulation layer and the meteorite shield, inspected and photographed the hole and also scraped off samples from the hole’s surface. On August 30, a drop in air pressure was registered on the ISS. The crew examined the compartments and add-on modules one by one to identify a two-millimeter hole in the hull of the Soyuz MS-09 spacecraft attached to the orbital outpost. In the evening of the same day it was patched up with several layers of epoxy resin. Pressure returned to normal. On August 31 the crew reinforced the patch with another layer of sealant.